The Low Down: Hmmm…Well, basically, a thirteen-year-old girl dies and goes to Hell and spends the rest of the novel trying to figure it all out. I’ve never read any other books by the well-known Mr. Palahniuk, but I am betting that all of us/most of us have read or seen or heard of Fight Club. Yep, he’s the same author, so you can imagine what kind of “subversive” (from the book jacket) craziness is between the covers. So there’s this girl named Madison. She’s the daughter of a famous actress and her dad’s a high roller in the business world. They have to be the most self-centered couple on the planet, leaving Madison (their own flesh and blood) at her Swiss boarding school alone over the Christmas holidays. The Spencers are stereotypcal “Hollywood Types.” Out of touch with the real world, their downtime is spent getting ready for their next photo op or junket or close up. Include in that the collection of adopted waifs and refugees from all over. Timed to coincide with a movie opening or some such thing, the children are soon dispatched to boarding school, never to be heard of again. They encourage Madison’s own drug use/reckless behavior as well. Madison slowly realizes that she needs to change to progress. And progress she does. Along with her gang of outcasts (seriously, the princess, the jock, the nerd and the punk) they go on an odyssey of sorts instead of settling for stereotypes and discarded popcorn balls. Best Thang ‘Bout It: Where do I start? Having just watched The Breakfast Club with my daughter just a scant few weeks ago, the comparisons made me laugh out loud. While the parts of the Underworld are described in disgusting detail, it just adds to the over-the-top nature of the story. It’s sharp, foul, vivid, detailed, funny, sad and gross. It’s as if Bender, Claire and a scab had a baby. Oh, and the nod to Judy Blume was genius. I’m Cranky Because: I must say that I had no idea where this book was going. Of course, we don’t know really exactly why Madison ended up in Hell, so half the fun is finding out (but it is slow going). While I am glad I read the book, I never ended up liking any of the characters that much. I just went along for the ride. 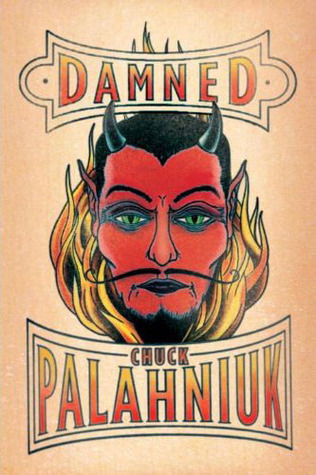 Damned by Chuck Palahniuk was published October 18, 2011 by Doubleday Canada. Ink and Page picked this book up from the library, so no one had a choice about whether it was reviewed.